Loeb knows about the big world of percussion. She plays North African frame drums; Japanese taiko drums; Middle Eastern tambourines; and the timpani, a favorite of the Western orchestra. But she also knows what it is to see the drums in a relatively narrow way. For several decades after she took up percussion, as a high school kid in New Rochelle, N.Y., Loeb played formal Western styles – classical music in the Crystal River Community Orchestra and the annual performances of the “Messiah” staged by the Aspen Choral Society (conducted by her ex-husband, Ray Adams); Aspen Community Theatre’s Broadway musicals. By coincidence, she quickly got the chance to put into practice what she had learned. A few months after the workshop, Loeb brought her mother to Carbondale, to live at the Heritage Park Care Center. 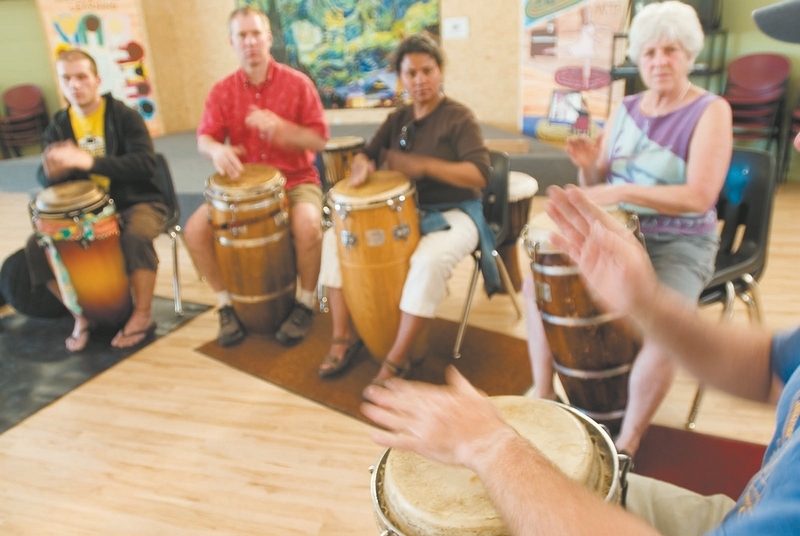 The facility had few activities that allowed the residents to actually participate in, rather than watch, and Loeb began leading drum circles at Heritage Park. The beauty of the drum circle was revealed, and Loeb began studying the therapeutic and community-building aspects of group drumming. This weekend’s Carbondale Mountain Fair opens, as it has for the last decade, with Loeb leading a drum circle. The tradition began when a power outage interrupted the Mountain Fair opening ceremonies. Loeb, who was scheduled to lead a communal drum session later in the weekend, rallied the troops; within 20 minutes, 80 people were banging on djembes, congas, cymbals and cowbells, and a tradition was born. It made perfect sense: 38 years ago, Loeb had founded the Mountain Fair, earning her the nickname, Mother of the Fair. When Loeb began playing, just the thought of a female drummer was about as foreign an idea as the drum circle. Loeb says there was just one woman playing drums in a professional orchestra back in the early ’50s: “Elaine something, playing in the New York City Center Orchestra. Not only was she female, she was black. So she had a real uphill battle,” Loeb said. Loeb herself had started on piano and accordion. But at the age of 12, she wanted to join the middle school band, and searched for an instrument. She was placed in the percussion section, and when the band needed someone to play a part on an arrangement of the “Dragnet” theme, Loeb picked up the timpani mallets and never looked back. She studied drums at Juilliard and played in the National Orchestral Association, whose concerts were broadcast weekly on the radio. At the University of Michigan, she studied music and psychology. The summers of 1957 and ’58 were spent at the Aspen Music School, and she decided to pursue Aspen over music. She moved to Aspen in 1961 to become a ski bum, fully realizing that the demand for trained percussionists here was limited. Instead of playing professionally, Loeb took on a series of jobs that showed an aptitude for improvisation: cocktail waitress, director of crafts fairs, custom rototilling, municipal affairs editor for the Valley Journal, ESL teacher, director of outreach and student services for Colorado Mountain College. But once she discovered rhythms that came from outside the concert hall and theater, the career door opened even wider. Loeb started teaching percussion as therapy for kids and Alzheimer’s sufferers, and providing the rhythm for African dance classes in Glenwood Springs. She launched a business, Rhythm of the Heart, that sells percussion instruments. Among the best uses she has found for drumming is the opening drum circle at Mountain Fair, scheduled for 4:05 p.m. today. Last year’s circle drew more than 400 drummers.